Hey, I’m kind of temporarily tired of blogging about technology and politics and even blogging about the Oregon Coast, so how about an Oregon waterfall? This shot of Oregon’s iconic falls – Multnomah Falls in the Columbia River Gorge – from our trip last month to Northern Oregon. Multnomah Falls is under an hour east of Porland on Interstate 84 where the easy access makes this one of Oregon’s most visited attractions and a tourism destination for over 100 years. The area is home to some wonderful hikes and great scenery along the gorge. Portland, charming Hood River, the Bonneville Dam, and The Dalles are all nearby. We had a great stay at the historic Columbia Gorge Hotel atop a waterfall on the cliffs above the Gorge near Hood River. 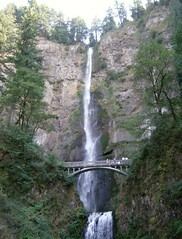 This entry was posted in oregon, oregon coast, Portland, tourism, travel and tagged columbia gorge, multnomah falls, oregon. Bookmark the permalink. Obama is going to bulldoze all waterfalls. I love Multnomah Falls. Every time someone visits me, I take them there just to see the look of awe in their faces. Also nearby are Wahkeena Falls and Bridal Veil Falls – not quite as spectacular but also not nearly as crowded. You did see the view from Vista House on the way to Multnomah Falls, too, didn’t you? The gorge is crazy gorgeous. Maggie we missed Vista House but did get a lot of good Gorge action. Hiked the new “million dollar” bike trail through old rail tunnels east of Hood River, Bonneville Dam, and the stay and meals at Columbia Gorge Hotel were really nice.